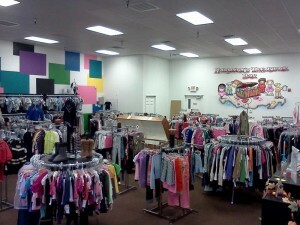 Your First Choice for New and Gently Used Children’s Clothes, Accessories and Maternity Wear! Largest Selection of Quality Clothing, Best Prices in Town, Paying MORE CASH than any other. Make Harmony’s Your First Choice! Harmony’s will soon feature Cloth Diapers (in store and online) and an online store for New Clothing! 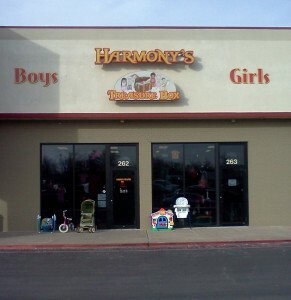 Harmony’s Treasure Box is your First choice for new and gently used children’s clothes, accessories and Maternity Clothes! We have your favorite name brands and the largest selection of Graco, Fisher Price, Carter’s, Gap, Roca Wear, Akademiks, Motherhood, Liz Lange and many more, sizes Preemie through 18/20 in Boys and Girls and XS-3X in Maternity Clothing. We also carry pack and plays, strollers. high chairs and other baby accessories. 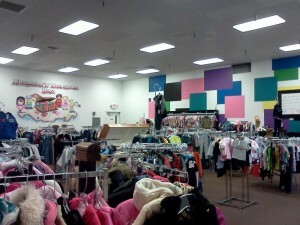 All Our racks are full of New and Gently Used Children’s clothes and Maternity wear. Gift Wrapping is available and so is layaway.